While Kieran Trippier leaves Burnley with a heavy heart after four years, he is excited at the opportunity he has been given at Spurs. The 24-year-old signed a five-year deal at White Hart Lane on Friday as he completed a £3.5m move from Turf Moor, after Spurs triggered the release clause in his contract. Burnley will take around £2.26m from the deal, with former club Manchester City entitled to £1.24m from a 40% sell-on clause of any profit. And, speaking to Spurs’ official website, he admitted: “It’s a great opportunity for me. “When I first heard that the club was interested, I didn’t have to think twice because it’s such a big club. “Now I just can’t wait to get started and show everyone what I can do. “I’m very keen to perform in training every single day, do the best I can and hopefully get the nod from the gaffer. “Whenever I get a chance, I want to do well for the other players, the staff and, of course, the fans. Trippier joins not only a top-six Premier League side, after a season at the top level with Burnley, and he is looking forward to experiencing European football, with Spurs in the Europa League. He added: “It’s an unbelievable feeling to be part of a club playing Premier League and Europa League football. It’s massive. “It’s always been a dream of mine to play in the Premier League and now being with a club regularly playing in Europe as well, I can’t wait to get underway. 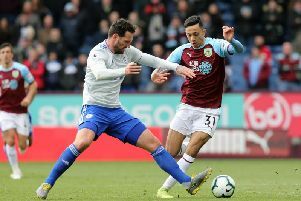 “I enjoyed my time in the Premier League last year with Burnley, and hopefully I can bring some of the lessons that I learned to Tottenham when I get a chance. “At Burnley, we knew it was going to be difficult last year but now, coming to Spurs, I want to improve. “I’m hungry to remain involved in the Premier League, it’s where I’ve always wanted to be since I was very young and I’ve got a great chance now with Tottenham.